piano at 5... bass at 15... Chapman Stick at 25... his first CD at 35... and now.... a brilliant second release Ed Rehm. He's one of those players whose spirit just permeates the music, as if the Stick were a more of a lens than an instrument, focusing our ears on the images that illustrate his musical journey. His personal demeanor might best be described as engaging and jovial, but there are many other sides to his nature that come out in his compositions, passionate, meditative, mysterious, grandiose. Pascal is celebrating his new CD release with several concerts in France, a country with a vibrant Stick scene, and a great appreciation for instrumental artists of all stripes (see tour dates below). The music reflects of the cultural crossroads that his country embodies. Jazz and blues from the west meet strong classical and folk traditions, with a North African wind blowing across the Mediterranean, dusting the music with unexpected harmonies, and English rock artists washing in from the north, (the main keyboard is a Yamaha CP80, so present in Peter Gabriel's music, for exmample). The liner notes and most of his website are written in French. That adds to the mystery and exotic quality of the record, with its occasional narrative voiceovers, frequently sparse instrumentation and long drawn-out saxophone and harmonica lines. Greg: Your new CD is great, very dramatic and mysterious in the compositions. Have you ever written music for theater or film productions, or performed for live theater? Pascal: Thank you very much, Greg, for you appreciation. I have sometimes written for theater productions. What I search for in music is, as you say, a degree of drama, as we can find from classical music to 20th century, and, after, in progressive music from 70's. Though I love a lot of different styles, I feel close of this one, I began music with piano and studied classical music, my musical cradle. To compose, I'm often inspired from a book, a picture, a photography, a film or a story. Greg: I was wondering where the title of the CD comes from? 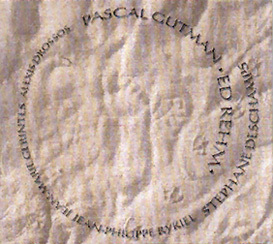 Pascal: So was I. I don't know exactly the meaning but I have an idea... Before giving it, I can explain how it came to me : before being the title ot the CD, "Ed Rehm" is the name of the four pieces of music constituting the music called "Ed Rehm" which have been written in one shot. And to the end of the composition process, the name came to me by the same way and I reported it. I was in Britain (not Allaire), often observing the marvelous starry nights and the moon. I think Ed Rehm refers to the moon. To complete the meaning, I added lyrics written by my friend Jerome Wacquiez (I wrote for him, for theatre). A friend found that Ed Rehm was a name given to pathways in the mountains. I like this definition of heights accessibility. Greg: There is a "live" quality to the recording. Some of that I think comes from the use of real instruments instead of sampled pianos, etc. Did you record as an ensemble or was it a layering process? Pascal: All the instruments, all the sounds were really played. Except my friend Jean-Philippe Rykiel who plays with his sampler, sounds of bandoneon, choirs, strings, some percussions, balaphon, harmonium... Not as samples or loops but as a keyboard. The few loops are made with the stick, a volume pedal, an e-bow and a repeater. The recording process depended of the music. I brought the written compositions and worked them with my old friend, pianist Stéphane Dechamps (on Yamaha CP80). We played and recorded together. For some, I had recorded some Stick parts, and Stephane recorded on them. The basics being made, Stick-Piano, Jean-Philippe recorded the synth parts, Jean-Marie Gerintes put the percussions, musical saw and harmonica, and Alexis Drossos the saxophones. You'll observe it's the same team than for "Cascades", my first CD. You know, we play together since 80's, so we know us very well and I have an idea of what I can expect from these wonderful musicians. Greg: Do you have some kind of special preamp you like to use. I noticed that your Stick sounds very clear without being "aggressive"? Pascal: For the time being I use a small and light preamp which works nicely, with a broad band-width, the most important thing to my hears. I find it reproduces very well the low end as the treble edge. The manufacturer, called FMR Audio, is located at Austin, Texas. The name of the preamp is RNP for Really Nice Preamp (I like the modesty). They also do a great comp (RNC you guessed) and a limiter (RNL, isn't it). For the CD I also used an old Sadovsky dual preamp (that I can fix on my belt) and the Mindprint DI Port. I used to put the Stick in some big preamps like Summitt Audio, Focusrite Red, Tube Tech... but this little FMR preamp is marvelous. When I record, I put the Stick in the preamp then directly in the computer or my DAT recorder. I must admit that the mixed and finalised sound of the CD by my friend Daniel Leon is exceptional. Without him I wouldn't have this sound. Greg: How do you compose? Do you write in your head? on the instrument? What is your process? Pascal: I take my Stick+preamp into the DAT recorder. Though I have a good software system, I never use it to create. I prefer my DAT as if I closed my eyes, because I don't like watching screen for this work phase. I want my mind free. I record during necessary time then let breathe the tape, forgetting it for some time. I stock my DATs and when it's time, I listen to them, catch the fruit, play on the Stick. "Le Cas Davreski" ad "Au Moulin" were composed like that. When I'm ready to record, computer is a great tool for recording, editing and finalysing. If I don't play, my tools are music sheet, a pencil and an eraser. I always have the Stick near me to verify if it's playable or for positions. "Ed Rehm" and "Tihualpaca" were composed like that. Greg: Are you touring with an ensemble to promote the recording at some future date? It would be marvelous to hear this music live in a concert. Greg: You told me about a funny gig you had on a bus recently, what was that about? Pascal: A bus stayed on a place. Isolated from the outdoor, light and sound, the windows inside become screens where films are projected. Sometimes one different per window, sometimes the same on all windows, sometimes a panoramic film on all the windows (wonderful), with pictures of cities of Africa or South America, deserts, starry nights (wow !). Each sequence was between 20 minutes 1 hour and half. When visitors go outside by the stairs of the bus, a moroccan living-room waited for them with a mint tea and Stick music played by me. It was a really nice trip for visitors ... and for me too! Greg: The French Stick association is a very strong organization of musicians. Do you think there something you think in your national character or culture that makes this so? Pascal: What gathers us is ... Stick and music. Sure, we have among us some fervent guys who are motors for the association, like Yannick Lepetit, Bruno Ricard, Youenn Landreau. "Association" means gathering of people involved in the same cause and objectives, acting with their energy to help evolve common ideas ... and ideals. When we have an oportunity to make discovery with the Stick, by the association we contact all together to see how to gather our means and advance things. We developed this formula for about 12 years now, with highs and lows, and the association is still there, thanks to the courage, character and motivations of persons. Greg: What influences do you think come through the most strongly in your music? What artists do you like to listen to the most? Pascal: What influences the most strongly my music is landscapes, pictures, still pictures more than moving ones, which have their own rythmn (that's ok only if it's to write music for film). I actually listen to Tricky, Lenine, Fiona Apple, sonatas for piano and works for cello and piano from Beethoven. The artists I listen to the most are Joni Mitchell, David Sylvian and the 65/69 Beatles. Greg: Congratulations on your 20 years of Stick playing!